Hollywood Style Report by Gwen Walters. Left:Jeanette MacDonald leads off on our feature posing in this stunning frost pink evening ensemble from her personal wardrobe. The slipper satin jacket conceals the softly draped bodice of the flowing chiffon gown. Miss MacDonalds cape is of silver fox. 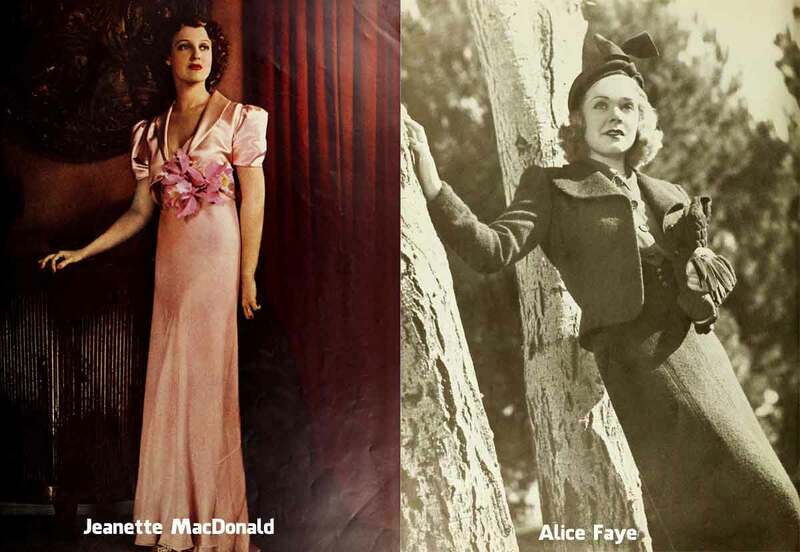 Right:Alice Faye wears a short corseted suit of plum woollen, strikingly contrasted by a crepe blouse . As with all suits this season, the shoulders are very much emphasised. Left: French actress Annabella, chooses a yellow sweater to highlight her chic three-button, beige tweed suit that is check-striped in brown and yellow. Charming and snug at the same time. 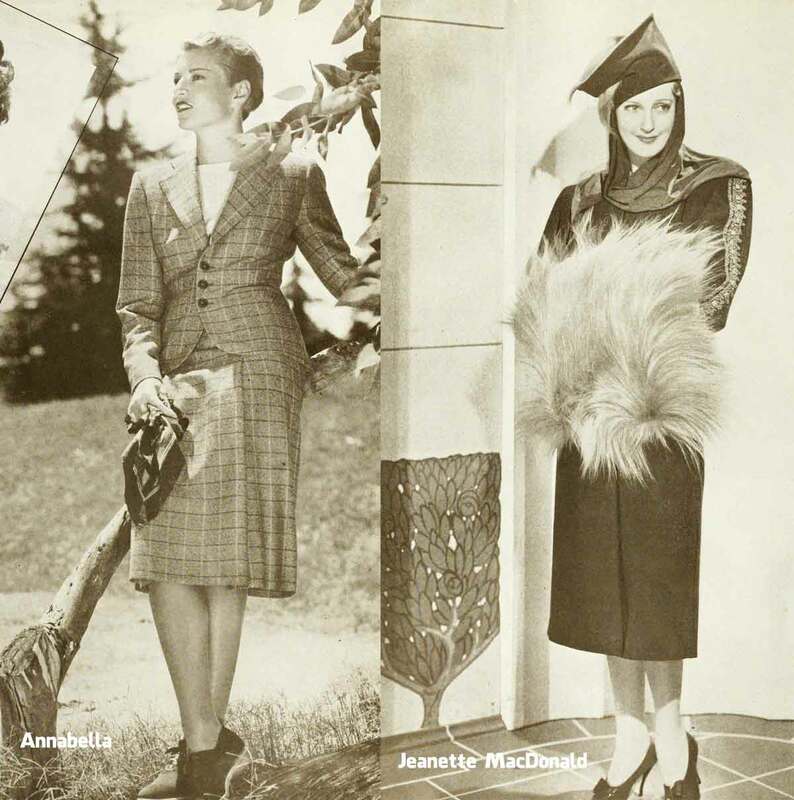 Right:Adrian dramatizes a svelte collarless princess coat of dark brown wool, created for Jeanette MacDonald, with a pillow muff of beige monkey fur and centre sleeve, silk-braid embroidery of matching hue. Adrian trims Jeanette’s Turkish turban of brown felt with monkey fur again, and drapes it with silk jersey. Left:Olivia De Havilland‘s dubonnet frock is distinguished by dolman sleeves, a high, draped neckline and its unusual fabric – heavy rough crepe with an all over candlewick motif. Her matching felt toque boasts the same candlewick treatment. 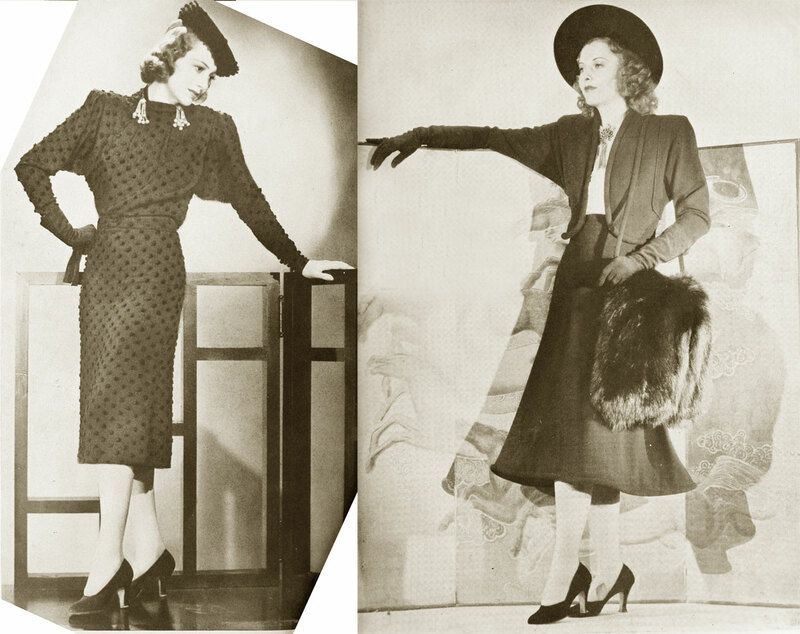 Right:Edward Stevenson designed this dressmaker suit of black woollen for Barbara Stanwyck to wear in “The Mad Miss Manton.” Self cording edges the flared skirt and brief bolero jacket which boasts the dolman sleeve. A dramatic note is reflected in the Postman’s bag of black fox. A charming gold and emerald brooch finishes off Barbara’s dainty lingerie blouse. Now comes the smart British influence … in felt hats for the winter season. 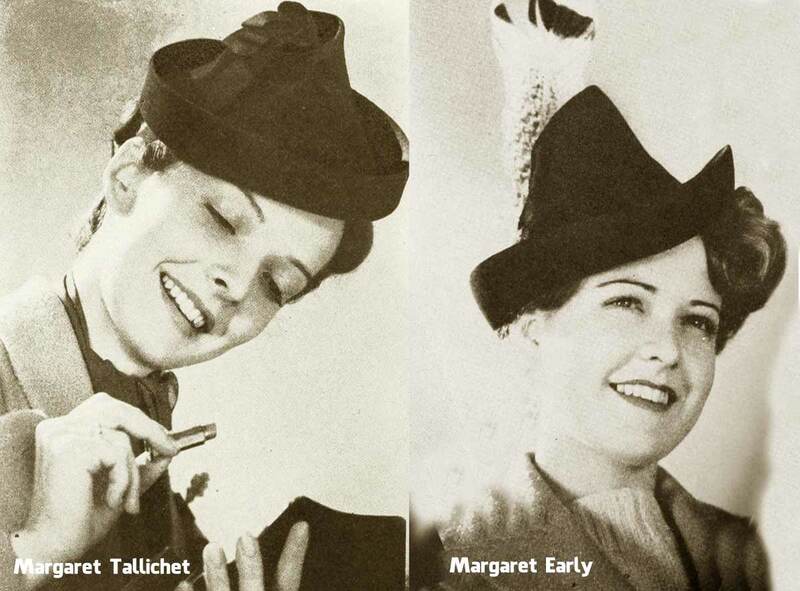 Left:Margaret Tallichet suggests the Byron “Tea timer”, a provocative version of the pillbox that tilts dangerously near the top of the nose, with tiny crown, peaked into a point, looped trim and chou of grosgrain banding. Right: Margaret Early takes her cue from Merry England of long ago and models “Sherwood,” a jaunty Byron felt hat with a high, dropped-tip crown, a softly rolling brim, a mottled grey quill soaring high. Left: For town wear Miss early models Roxford’s “Cocktail Hour”, a s intriguing a hat as you’ll ever see. The brim, high-cuffed in back, turns sharply to a soft roll for the front. The modified stove-pipe crown, relieved by a feather pompon and a dashing quill, gives height. 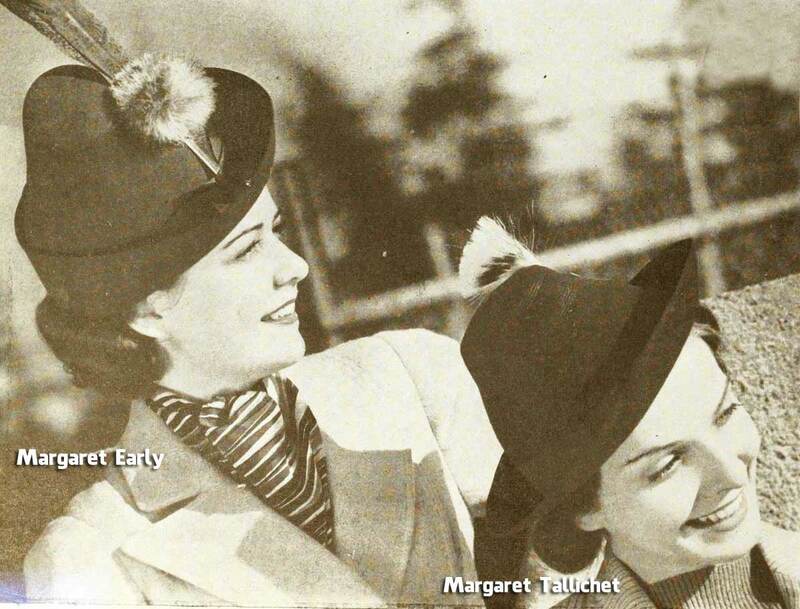 Right: Miss Tallichet goes ‘sports-woman,’ wearing the “Aintree,” trim Roxford sports felt, deftly stitched on crown and brim with contrasting shade, with an audacious badger brush to top off the crown. Equal amounts of beauty and ridiculous nonsense much like the fashion trends of today and likely tomorrow.